Oct. 17, 2011, 10:30 a.m.
Why hasn’t #OccupyWallStreet trended in New York? A new SocialFlow analysis suggests that the movement’s growing popularity might actually have hurt its chances to trend. By Megan Garber @megangarber Oct. 17, 2011, 10:30 a.m.
#OccupyWallStreet, the most commonly used Twitter hashtag since the start of the 99 Percent movement, has trended in Vancouver, Portland, and San Francisco…but not in New York. #OccupyBoston has trended in numerous cities across the U.S., but never in Boston itself. 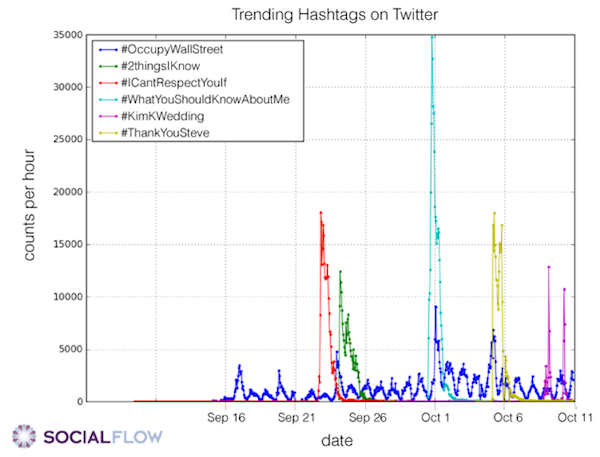 In a blog post analyzing Occupy Wall Street as a trending topic, SocialFlow‘s vice president of R&D, Gilad Lotan, explores those ironies, analyzing all the OWS-related terms that have trended on Twitter since the start of the movement, their volume of appearance in tweets, and the times and locations they’ve trended. There are other explanations, too: Trending Topics compete with others for user attention — and #OccupyWallStreet has been up against both #ThankYouSteve and, yep, #KimKWedding. And the lack of a single hashtag for the movement overall — “splinted conversations,” Lotan calls it — likely also impeded its ability to break through. But what’s most interesting, to me, are the assumptions baked into the Trending Topics algorithm in the first place. On the one hand, it’s perfectly fair — in fact, it’s perfectly necessary — to define “trends” as brief ruptures of the ordinary. Spikes, you know, speak. But the algorithm’s assumption is also one that’s baked into the cultural algorithm of journalistic practice: We tend, as reporters and attention-conveners, to value newness over pretty much everything else. Again, on the one hand, that’s absolutely appropriate — “the news,” after all — but on the other, the institutional obsession with newness often impedes journalists’ ability to address the biggest issues of the day — the economy, the environment, the effects of the digital transition on global culture — within conventional narrative frameworks. Just as #OccupyWallStreet, in Twitter’s algorithm, competes against #KimKWedding, we pit the long-term and the temporary against each other, forcing them to compete for people’s (and journalists’) attention. We accept that the slow-burn stories have to fight for space against the shocking, the spiking, the evanescent. POSTED Oct. 17, 2011, 10:30 a.m.
Garber, Megan. "Why hasn’t #OccupyWallStreet trended in New York?." Nieman Journalism Lab. Nieman Foundation for Journalism at Harvard, 17 Oct. 2011. Web. 22 Apr. 2019. Garber, Megan. "Why hasn’t #OccupyWallStreet trended in New York?." Nieman Journalism Lab. Last modified October 17, 2011. Accessed April 22, 2019. https://www.niemanlab.org/2011/10/why-hasnt-occupywallstreet-trended-in-new-york/. | title = Why hasn’t #OccupyWallStreet trended in New York?